You’re no doubt studying the Train2Game Games Designer, Games Developer or Games & Animator course because you have a creative vision. You have an idea for an awesome game that you want to develop, publish and show the world. It might be difficult to ‘sell’ your idea to a publisher, but that hasn’t stopped developers in the past, including those of Bejeweled – one of the most popular games of all time. The casual title has sold over 50 million copies since it was launched by PopCap ten years ago. The game has won countless awards and is available on PCs, iPhones and Facebook with 200 million games being played everyday. However, things weren’t always so rosy as PopCap’s Dave Bishop told an audience at The Develop Conference yesterday. The industry veteran revealed that when the first build of the game was completed in 2000, a variety of publishers turned down the opportunity to buy Bejeweled for just $60,000. Given the success of the title in the decade since then, a few of them probably that regret that decision! They verge on the ridiculous don’t they? A popular game with motorbikes, how about Road Rash or Grand Theft Auto IV: The Lost & Damned!? Collecting giant coins seems to have worked for Mario over the years and whoever thought games weren’t supposed to be fun eh? 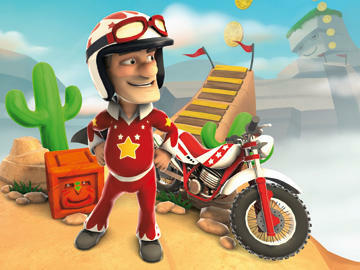 So, what message can Train2Game students take from the ballads of Bejeweled and Joe Danger? Well first of all it’s that you should never give up, as Bejeweled shows that even one of the most successful games of all time struggled to begin with. Secondly, these games show that you can’t always rely on a publisher to give you the support you think your game deserves. However, thanks to the wonders of the internet it’s now easier than ever to get your independent production out there with Steam, the PlayStation Network and Xbox Live all providing outlets for indie developers. So, what do you think about the comments made at Develop yesterday? Do you think you’ll try to rely on a publisher, or will you take the self publishing route? As usual, leave your comments here or on the Train2Game forum. This entry was posted in games, Train2Game and tagged Bejewled, Develop, Develop Conference, Game Publishers, Hello Games, Joe Danger, Popcap, UK Games Industry, Video Games by Train2Game Blogger Team. Bookmark the permalink. ”Can Joe be a monkey? We like Monkeys” Honestly, if I had to be rejected for a game, I would like something like this to be said to me. Sure it would still make me angry but I would also laugh at certain points in my anger. Is this one of those quotes that comes with a facepalm…By jove, yes it does *applies face to palm* Seriously, that’s just ignorrance, both on retrospective (Excitebike, Super Hang-On) and current (Moto GP games, Grand Theft Auto series). But the rest of the game is realistic? Uhhhhh…I would have what he’s taking, if I wasn’t straight edge, because damn it must be powerful. Okay this one is a fair comment. So I’ll let it slide. I bet this is the same guy who wanted the monkeys in the game. That or he wanted to make the game into a skateboarding dog who collects bananas so that he can build a rocket ship to the moon to rescue his sweetheart, who is a liama. Dosen’t make sense? Ask the realistic guy, he’s tell you it makes perfect sense. *looks on Itunes* …Right. Remind me not to take business advice from this guy. Or any kind of advice. Or actually to not talk to him ever.